a green and honest image. Every day, our Nice hotel strives to minimise its impact on the environment as much as possible, protect natural resources and reduce pollution. Reduce our water and energy consumption by using technological solutions and eco-friendly everyday actions. Reduce waste production by buying in bulk, sorting waste and removing dangerous waste in line with regulations. Use local and eco-friendly products and suppliers wherever possible. Ensure our staff work with an understanding of how their actions affect the environment. Inform our clients of any projects our team conduct for the environment and what they can do to help our efforts. To give our system structure and credibility, we have relied on the European Ecolabel benchmark for tourist accommodation. The official label is a sign of environmental quality awarded by the AFNOR Certification and valid on a Europe-wide scale. The Hotel Florence Nice also uses Betterfly Tourism to manage and guide the success of its actions in terms of sustainable development. Please join us in our efforts, nature will be grateful. The whole team at the Hôtel Florence Nice is here to discuss our policy and projects with you. What sets our hotel in Nice apart ? There are 3 rooftop hives with thousands of bees buzzing around and producing an average of 40kg of honey a year. This means that the Hotel Florence Nice is helping to protect bees and helping beekeeping to flourish in Nice. Did you know that my bees buzz around in better conditions in the city centre than in the countryside? That's because in the city there are flowers all year round, no pesticides and far fewer hornets. A single bee can gather pollen from 700 flowers in just one hour! Honey made in Nice at the Hotel Florence Nice is the result of thousands of journeys between the flowers on the Promenade du Paillon, the city's parks and gardens, neighbouring balconies and hives. The workers are at it all year and a Nice beekeper visits on a regular basis to check everything is OK. 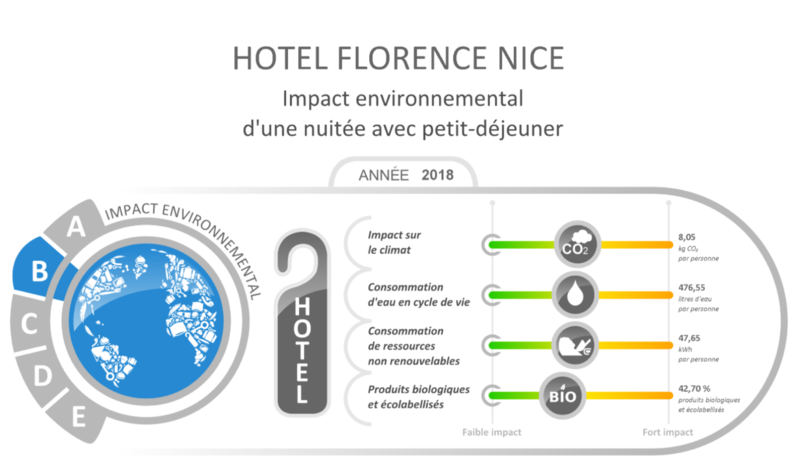 The city of Nice is laying down several environmental roots as part of a quality system focusing on eco-friendly tourism which is where the Hotel Florence Nice comes in. Between the sea and summits, it's a day-to-day eco-friendly, green and peaceful setting that you have chosen with a stay at our 3* hotel. Keep your carbon footprint down and use green transport during your stay in Nice at the Hotel Florence. Vélobleu bike stands are available throughout the city as well as in the areas of Saint-Laurent-du-Var and Cagnes-sur-Mer. Rent your bike 24/7 with this self-service system. Pick up a bike from a stand and drop it off at another one. The 1st half hour is free, please visit the website for further information. If you rent a bike for several days, the Hotel Florence Nice will store it for free in the hotel basement ! Drive round the Côte d’Azur without the pollution ! Based on the same idea as Vélobleu, the city of Nice provides an electric car sharing service called Autobleue. Electric car hire available 24/7 from 68 self-service stands. One shared Autobleue car replaces 4-8 private cars and reduces consumption of fossil fuel and greenhouse gas. The city of Nice is home to over 300 green spaces: parks and gardens. Take a deep breath of fresh air in the Azur Capital and soak up the « Green City of Mediterranean ». Visit the Jardin Albert 1er and Parc de la Colline du Château near the Hotel Florence Nice, Parc Vigier near the Nice Port and the famous Promenade du Paillon. Stroll in an iconic site in Nice: the Promenade du Paillon, Nice's green lung. This park is a natural haven in the very heart of the city centre near Place Masséna. This relaxing space is bursting with trees and flowers and children love playing in the huge wooden structures! Nestled in the heart of Nice, the Promenade du Paillon has been designed to respect nature and the environment. Sustainable and renewable materials have been used here e.g. benches in wood from sustainably managed forests. Water and electricity use has been designed to be restricted. Visit the Phoenix botanical and wildlife park just a 20 minute drive from the Hotel Florence, opposite Nice Airport and the Promenade des Anglais. Take the family on a trip to Phoenix Park near Nice Airport opposite the Promenade des Anglais. The 7ha of greenery at Phoenix Park is home to countless species of plants and animals and open all year. Phoenix Park has a flora and fauna conservation programme to promote biodiversity.